The Curry Tree (also called Karivepallai,Karivembu or Kadipatta) is a kind of tree. It is found mostly in hot climates, and is a native plant of India. 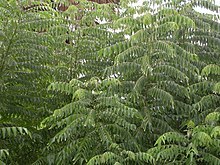 The leaves of the curry tree are called curry leaves or Sweet Neem leaves. Usually, curry trees grow to 4-6 metres tall, and their trunk grows to 40 centimetres in diameter. Small black, shiny berries that grow on the tree can be eaten, but their seeds are poisonous. The scientific name of the curry tree, Murraya koenegii, was chosen to celebrate the botanist Johann Koenig. ↑ "Murraya koenigii information from NPGS/GRIN". www.ars-grin.gov. Retrieved 2008-03-11. Wikimedia Commons has media related to Murraya koenigii. This page was last changed on 8 November 2015, at 06:53.